Wednesday was supposed to be a day of no news in Major League Baseball. There are no league games in January, of course; pitchers and catchers report to spring training in 29 days. And exit polling had long foreseen the shutout ballot, for the first time since 1996, that the Baseball Writers Association of America would submit in voting on nominees to the Hall of Fame. And yet here came Major League Baseball 2K, long maligned and practically disowned by its corporate parent, with the shocking announcement that it would return for one more year past the end of a deal hated by both gamers and the publisher. It says a lot when a video game series made the biggest news involving baseball this week. Sure, the baseball writers' refusal to elect any players from the so-called Steroid Era dominated headlines, as did the tendentious and self-parodying bitching and moaning on both sides of the debate. Still, two federal trials and the five-year run-up to Roger Clemens' and Barry Bonds' candidacy prepared fans for that needless psychodrama. But since May-ay-ay, everyone considered MLB 2K-ay-ay—the unluckiest sports video game on the face of the Earth—to be as good as gone. How and why it came back, assuredly on terms deferential to 2K Sports, serves as a costly lesson of sports video gaming's own shameful period: The Exclusive Era. This began in 2005, and the story is familiar to sports gamers. Sega, then the publisher of the 2K line of sports titles, before it became known as 2K Sports under Take-Two Interactive, was in single combat against EA Sports in American football, the glamour franchise of sports video gaming. After NFL 2K5 and Madden 2005 released in 2004—to the highest aggregate review scores any sports franchise has seen since, much less by competitors—EA Sports negotiated an exclusive license with both the NFL and the NFL Players Association. Sega, run out of the console business three years before, jettisoned its sports operation. 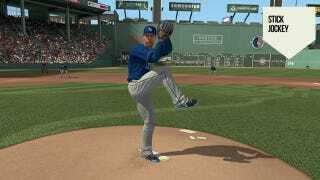 The new money running Take-Two Interactive bought off Sega's sports studios and decided to bet big on baseball, killing off EA Sports' MVP Baseball. Begun, the exclusive contracts had. What no one seemed to foresee was how these leagues would renegotiate these deals or change licensees at the end of them. To that point, why would they worry about this? Up to 2005, the North American sports leagues had treated anyone with enough cash and market presence equally. NFL Blitz, a Midway product, went out alongside Sony's NFL GameDay. Both are now long, long gone. Baseball had not only ESPN Major League Baseball 2K and MVP Baseball but also the PlayStation's old Major League Baseball series under 989 Sports—which would later become MLB The Show. What was in place in 2005, thanks to the technology and the economy of the times, were a lot of studios and publishers with serviceable game engines, developing for consoles whose standard-definition limitations could hide or excuse a rush job on rendering things like Albert Pujols' face. But in 2013, as development costs and gamer expectations have ballooned, there is practically no publisher with any off-the-shelf capability to take over a league license and put out a credible game based on that sport in a single year. 2K Sports conceivably has muscle in football (and hockey, if it cared to) thanks to All-Pro Football 2K8, which released on the Xbox 360 and PS3 in 2007. But All-Pro had no franchise mode, has no real world stadiums, has none of the 1,500 real world football players that need to be rendered in high defintion, and that was five years ago. As much as video gamers harp on annual sports titles being roster updates, the fact remains that kind of accuracy counts, and the inability to deliver it fails the least of the baseline expectations facing a product with extremely expensive costs. On the other side, EA Sports, for all of its might, and for all of the love of its old MVP series, has not published a baseball video game on this console generation. Its last entry was a college baseball game for the PS2. The idea it could, in less than a year's time, build a game that not only overcame gamers' expectations of baseball on the Xbox 360, but didn't do harm to what they remembered on the original Xbox, is farfetched. Even if EA Sports was at baseball's doorstep with satchels of cash open the day after MLB 2K12 released, there's no way it could build a decent game in time, and it knows this, which is why that label is sitting baseball out until the next console generation. Indeed, this year may serve as a bridge to such a day. Bottom line? Because of the time it now takes to build a simulation quality sports video game today, and because of the timing of the contracts struck a generation ago, as we come to the end of exclusive licenses, it is the leagues who are screwed. Do they want to ditch the agreement and go to the highest bidder? OK. Who is that bidder? Ubisoft? Activision? The NFL has an uncommonly close relationship with EA Sports, but who is really in charge, there? Could 2K or anyone really, after putting up all the money that league would expect for the license, have a product ready to go in August 2014 if those two parted ways at the end of this year? Are you kidding? Those who have chosen a single dancing partner—are you listening WWE?—must go home with them, or sit out the next several songs. That's what led Major League Baseball back to 2K Sports. Because developing a sport's video game is not like broadcasting one. You can't just hire up a camera crew and booth personalities and show up on opening day ready to film the action. No one else had the means to make a baseball video game for the Xbox 360 in 2012. That is the only reason we're seeing MLB 2K13 in March. If MLB wanted to be on the dominant console in baseball's dominant continent, it was going to do it according to 2K Sports' terms or not at all. For a video game company said to have lost $30 million a year on its last deal, making a product almost universally panned by its critics and customers for four straight years, the insane power with which it could and presumably did dictate terms—to the oldest professional sports league in the world—is the lasting lesson of The Exclusive Era.